Standard reports are useful to an extent. Custom reports and dashboards, on the other hand, allow you to compile metrics that give you much more useful insights of how your online shop is performing. Monitoring and reviewing the right data is essential for deciding which tactics or initiatives you should try, or marketing platforms to focus on, to help you sell more. If you are very familiar with how Google Analytics (GA) works, then you would set up some custom reports and dashboards to quickly access your key metrics. But if you are not as knowledgeable about the quirks and inner workings of GA then you should take advantage of the many custom reports and dashboards available for import. We can also help you build custom dashboards. 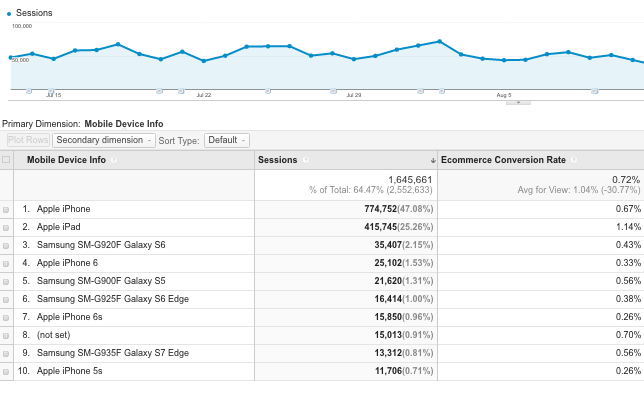 There is a huge number of reports available in Google Analytics Solutions Gallery; used, created and shared by experts. They’re all done from scratch and designed to maximise your use of Google Analytics, but the huge amount of solutions from dashboards and channel groupings to segments and custom reports do require some time to find what’s right for your needs. From our experience setting up ecommerce tracking and reports for companies like MADE.com, British Red Cross Training, Pensions and Lifetime Savings Association, these reports and dashboards are valuable when analysing purchase data. Keep an eye on your ecommerce conversion rate across five different tabs covering channels, keyword, mobile devices, cities and campaigns. Focussed on high traffic sources, each section shows where it’s not up to scratch and needs your attention and tweaking. Get ecommerce conversion rate performance custom report. Duplicate transactions can greatly skew your numbers and affect your reporting, making you doubt the accuracy of your data. Duplicate order data is sent to Google Analytics typically because the page containing such information has been loaded twice. This can happen when the page is refreshed or loaded again. To find whether your data contains duplicate transactions, add our custom report to the view you want to check. Get a custom report to check for duplicate transactions. If you have more than 1 transaction in any row (or per an individual transaction ID), that means you have duplicate transactions stored in your data. It’s worth checking the report on a regular basis, eg monthly, to make sure that there are no duplicates or they’re kept to the minimum. Lunametrics blog has a number of suggestions for how to fix duplicate transactions. This overview dashboard brings important top level metrics into one place, so you don’t have to go searching for them in multiple reports. You will quickly see which of your campaigns, channels, and sources are bringing in the most revenue, whilst comparing conversion rates across each. See how your customers are engaging with your site, content and product (or page, depending on the setup) categories. You’ll get information on what they search for, and which categories and landing pages bring in the most revenue. Get ecommerce content performance dashboard. Looking for improving your ecommerce tracking and reporting? Get in touch with our qualified experts.